It seems hard to believe, but could double-jointedness be an indication that you may be at risk for obstructive sleep apnea? Ehlers-Danlos syndrome (EDS) is a condition that affects cartilage throughout the body, including along the airway, and this may predispose afflicted individuals to sleep-disordered breathing, fragmented sleep, and daytime sleepiness. Learn about the symptoms, subtypes, prevalence, and link between Ehlers-Danlos and sleep apnea, and whether treatment may help. Ehlers-Danlos syndrome (EDS), or Ehlers-Danlos disorder, is a group of disorders that affect the connective tissues that support the skin, bones, blood vessels, and many other tissues and organs. EDS is a genetic condition that impacts the development of collagen and associated proteins that serve as the building blocks for tissues. Its symptoms have a range of potential severity, causing mildly loose joints to life-threatening complications. Mutations in more than a dozen genes have been linked to the development of EDS. Genetic abnormalities affect the instructions for making pieces of several different types of collagen, a substance that gives structure and strength to connective tissues throughout the body. The collagen and associated proteins may not be assembled properly. These defects lead to weakness in tissues in the skin, bones, and other organs. There are both autosomal dominant (AD) and autosomal recessive (AR) forms of inheritance, depending on the subtype of EDS. In AD inheritance, one copy of the altered gene is enough to cause the disorder. In AR inheritance, both copies of the gene must be altered for the condition to occur and parents may often carry the gene but be asymptomatic. Combining the various forms, EDS is estimated to affect about one in 5,000 people. Joint hypermobility: There may be an unusually large range of joint movement (sometimes referred to as being “double-jointed”). These loose joints may be unstable and prone to dislocation (or subluxation) and cause chronic pain. Skin changes: The skin may be soft and velvety. It is highly stretchy, elastic, and fragile. This may contribute to easy bruising and abnormal scarring. Weak muscle tone: Infants may have weak muscles with delays in motor development (affecting sitting, standing, and walking). It can be helpful to review the six subtypes of EDS in order to better understand the associated symptoms and potential risks. Classical type: Characterized by wounds that split open with little bleeding, leaving scars that widen over time to create “cigarette paper” scars. This type carries a lesser risk of blood vessel tearing. It has an autosomal dominant inheritance, affecting one in 20,000 to 40,000 people. Hypermobility type: The most common subtype of EDS, it manifests with predominately joint symptoms. It is autosomal dominant and may affect one in 10,000 to 15,000 people. Vascular type: One of the most serious forms, it may cause life-threatening, unpredictable tearing (or rupture) of blood vessels. This may cause internal bleeding, stroke, and shock. There is also an increased risk of organ rupture (affecting the intestine and the uterus during pregnancy). It is autosomal dominant but only affects one in 250,000 people. Kyphoscoliosis type: Often characterized by severe, progressive curvature of the spine that can interfere with breathing. It carries a reduced risk of blood vessel tearing. It is autosomal recessive and rare, with only 60 cases reported worldwide. Arthrochalasia type: This EDS subtype may be discovered at birth, with hypermobility of the hips causing dislocations of both sides noted at delivery. It is autosomal dominant with about 30 cases reported worldwide. Dermatosparaxis type: An extremely rare form, it manifests with skin that sags and wrinkles, causing extra redundant folds that may become more prominent as children get older. It is autosomal recessive with only a dozen cases noted worldwide. What is the link between Ehlers-Danlos syndrome and obstructive sleep apnea? As noted, the abnormal development of cartilage affects tissues throughout the body, including those that line the airway. These problems may impact the growth and development of the nose and maxilla (upper jaw) as well as upper airway stability. With abnormal growth, the airway may be narrowed, weakened, and prone to collapse. The recurrent partial or complete collapse of the upper airway during sleep causes sleep apnea. This may lead to drops in blood oxygen levels, fragmentation of sleep, frequent awakenings, and reduced sleep quality. As a result, excessive daytime sleepiness and fatigue may occur. There may be increased cognitive, mood, and pain complaints. The other symptoms of sleep apnea, such as snoring, gasping or choking, witnessed apnea, waking to urinate (nocturia), and teeth grinding (bruxism) may also be present. A prior small survey of EDS patients from 2001 supports increased difficulties with sleep. It was estimated that of those with EDS, 56 percent had difficulty maintaining sleep. In addition, 67 percent complained of periodic limb movements of sleep. Pain, especially back pain, was increasingly reported by EDS patients. How Common Is Sleep Apnea in Ehlers-Danlos Syndrome? Research suggests that sleep apnea is relatively common among those with EDS. A 2017 study of 100 suggests that 32 percent of those with Ehlers-Danlos syndrome have obstructive sleep apnea (compared to just 6 percent of controls). These individuals were identified as having hypermobile (46 percent), classical (35 percent), or other (19 percent) subtypes. They were noted to have an increased level of daytime sleepiness as measured by the Epworth sleepiness score. The degree of sleep apnea correlated with the level of daytime sleepiness as well as a lower quality of life. When sleep apnea is identified, clinical experience supports a favorable response to treatment among patients with Ehlers-Danlos syndrome. 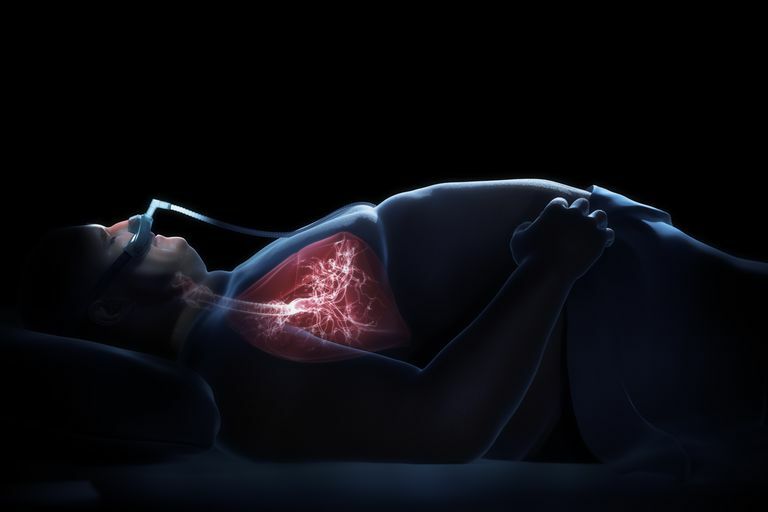 As age increases, sleep-disordered breathing may evolve from limited airflow and nasal resistance to more apparent hypopnea and apnea events that characterize sleep apnea. This abnormal breathing may go unrecognized. Daytime sleepiness, fatigue, poor sleep, and other symptoms may be overlooked. Fortunately, the use of continuous positive airway pressure (CPAP) therapy may provide immediate relief if sleep apnea is properly diagnosed. Further research is needed to assess the clinical benefit of sleep apnea treatment in this population. If you feel you may have symptoms consistent with Ehlers-Danlos syndrome and obstructive sleep apnea, start by speaking with your doctor about evaluation, testing, and treatment. Gaisl T, et al. “Obstructive sleep apnoea and quality of life in Ehlers-Danlos syndrome: a parallel cohort study.” Thorax. 2017 Jan 10. Guilleminault C, et al. “Sleep-disordered breathing in Ehlers-Danlos syndrome: a genetic model of OSA.” Chest. 2013 Nov;144(5):1503-11. “Ehlers-Danlos syndrome.” Genetics Home Reference. U.S. National Library of Medicine. 2017 Feb 21. Verbraecken J, et al. “Evaluation for sleep apnea in patients with Ehlers-Danlos syndrome and Marfan: a questionnaire study.” Clin Genet. 2001 Nov;60(5):360-5.